Showing 35 articles from October 25, 2017. LOUISBURG -- After meeting behind closed doors for about three-quarters of an hour Monday evening, the Franklin County Board of Education emerged to announce that it had agreed to hire a new school superintendent, ensuring that the district would have a smooth leadership transition. 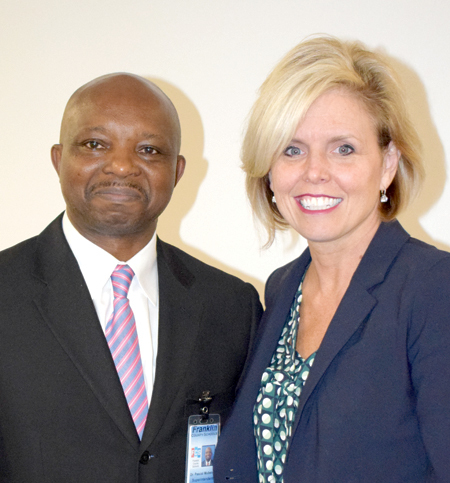 Just the week before, Franklin County Superintendent of Schools Dr. Pascal Mubenga announced that he is leaving to take the helm of the Durham Public School System. A months-long search for a new Louisburg College president has apparently been narrowed down to two finalists -- and a decision is expected very soon, perhaps as early as next week, according to those close to the situation. WHITE LEVEL -- On a map, communities like White Level, Wood, Centerville and Gold Sand show up in the northeastern part of Franklin County. However, a group of residents from those often forgotten-about areas of Franklin County are working to make them the center of attention. Residents and leaders from those communities want to reshape the economic landscape of northeastern Franklin County and have formed a group to reach that goal. LOUISBURG -- When Agriculture Commissioner Steve Troxler stands up and says he wants farming to become a $100 billion industry in North Carolina, Sue Gray stands up with him. As ag commissioner, Troxler is the beacon for farming, shining a light on what can be grown and raised in this state. 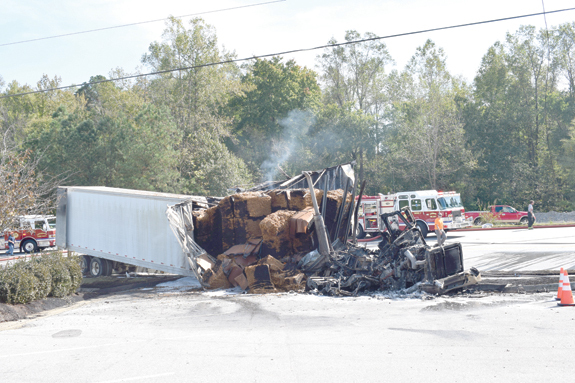 Louisburg police charged a Youngsville man with making an improper maneuver they allege caused a fiery accident involving a tractor trailer on Saturday. According to the report by Officer T.W. Lincoln, Morris Smith, 50, was attempting to make a right turn from Golden Leaf Drive onto Bickett Boulevard when he pulled into the path of a southbound semi. LOUISBURG -- Franklinton and the Greater Franklin County Chamber of Commerce are hosting a candidates' forum tonight (Thursday), giving voters one of their last chances to get to know potential politicians before the Nov. 7 election day. Early voting for elections in Bunn, Franklinton, Louisburg, Youngsville and Wake Forest began last Thursday and runs through Nov. 4. 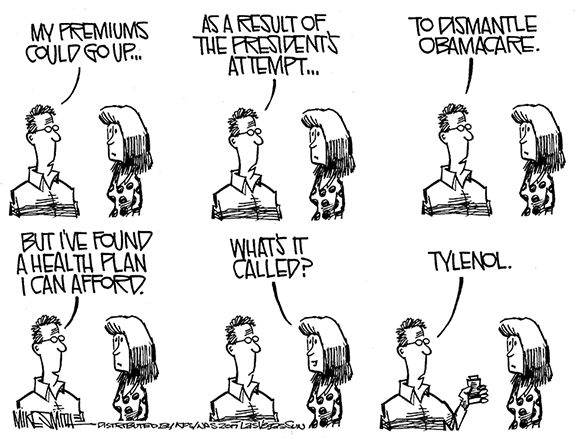 Is spewing hatred and lies just free speech? The controversy about NFL players kneeling during the National Anthem has triggered some interesting arguments about the First Amendment and how many rights Americans have to express their feelings and beliefs. What's been fascinating is all the emotion that has been invoked, especially when President Trump has stoked the fires of controversy and the NFL's leadership can't seem to figure out what side of the dispute it is on. Youngsville has a problem brewing. 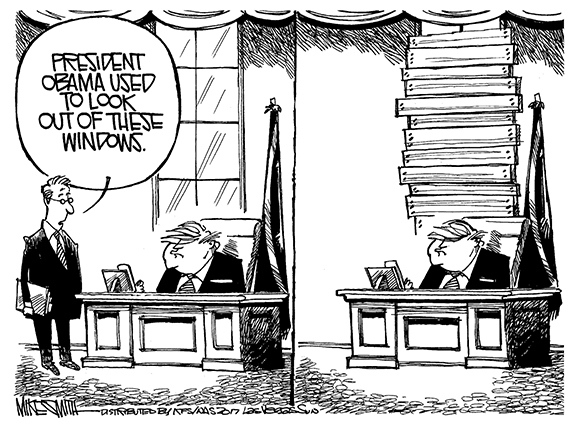 And the rest of Franklin County would be well advised to sit up and pay attention to the debates in that community, because their problems are coming to the rest of the county, perhaps slowly, but they are on the horizon. This coming Tuesday is Halloween, so you know what that means? People get to dress up as their favorite ghouls, goblins and monsters. It used to be that October 31 was the only acceptable day that people got to expose fangs, bare some claws and truly act in a nefarious way. Dear editor - I was saddened to learn of the death last week of Ann House, owner and conservator of Franklin County's historic Laurel Mill and co-owner of A&B Tours. I knew Ann only slightly, but I had talked with her several times. I found her to be very friendly and straight forward. WAKE FOREST --Brandi Leann Fuller, 23, died Monday, Oct. 23, 2017. Services will be private. YOUNGSVILLE -- Clifford Burt Gilliam went home to be with his Heavenly Father on October 23, 2017. He was born in Franklin County on November 28, 1923, to the late Charles Edward and Lillian Burnette Gilliam, and graduated from Bunn High School in 1941. LOUISBURG--Harvey Allen Carpenter, 63, died Monday, Oct. 23, 2017 at his home. Visitation will be held tonight, Thursday, Oct. 26, from 6 to 7:30 p.m. at Lancaster Funeral and Cremation Services. HENDERSON--Funeral services for Marie Alston, 74, who died Tuesday, Oct. 17, 2017, will be held Saturday, Oct. 28, at 12 p.m. at Harriett Baptist Church in Henderson. GREAT ESCAPE. 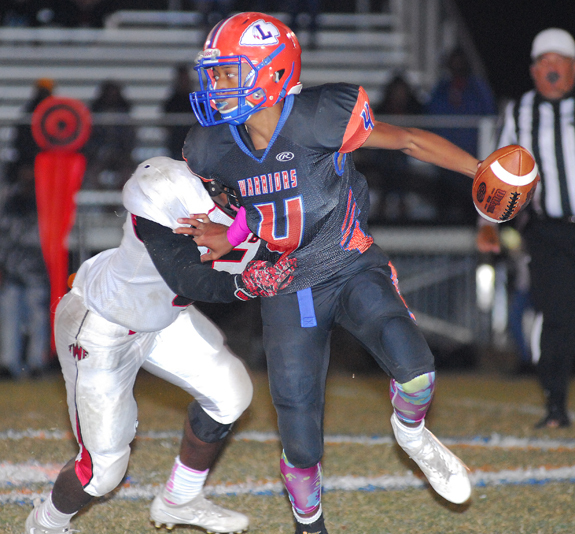 Louisburg High School quarterback Jaheim Brown tries to evade a Webb defender during last Friday's football contest at Patterson Field. LOUISBURG -- Just when all hope appeared to be lost, Louisburg High School gained a huge boost of momentum late in the Warriors' homecoming game last Friday against Oxford Webb. Webb looked to be on the verge of clinching the victory, but a botched handoff just in front of the goal line was scooped up by Louisburg's Malik Davis, who ran 96 yards for an electrifying touchdown that brought the Warriors back to within six points with over five minutes remaining. YARDAGE LOCATOR. 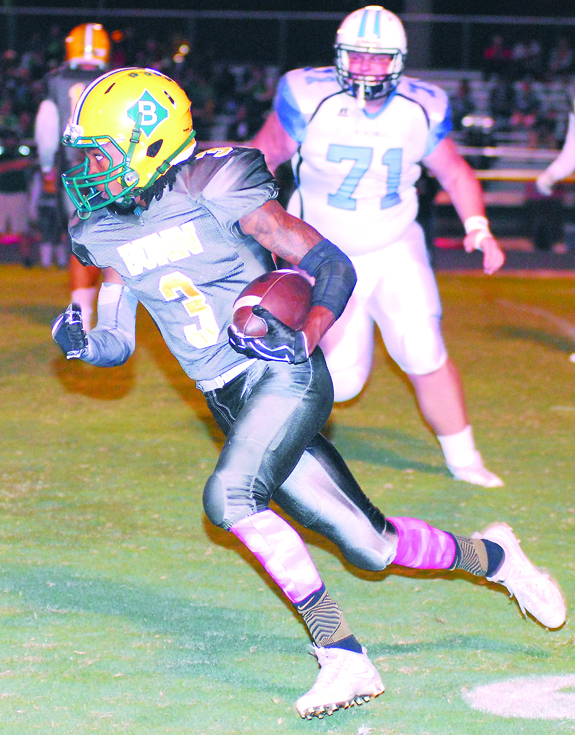 Bunn's Tyre Davis picks up yards around end for the Wildcats during last Friday's home game against rival South Granville. 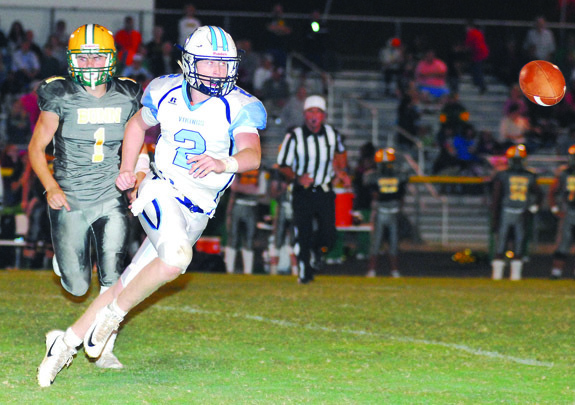 BUNN -- For one half, the latest Bunn-South Granville football grudge match closely resembled last year's contest -- a low-scoring affair destined to turn on the outcome of one or two plays. But that wasn't the case during what would prove to be a prolific second half of offensive action. CAN'T BE STOPPED. Whitney Bolton (right) delivers a kill for Louisburg during Tuesday evening's home volleyball playoff triumph against Northside. 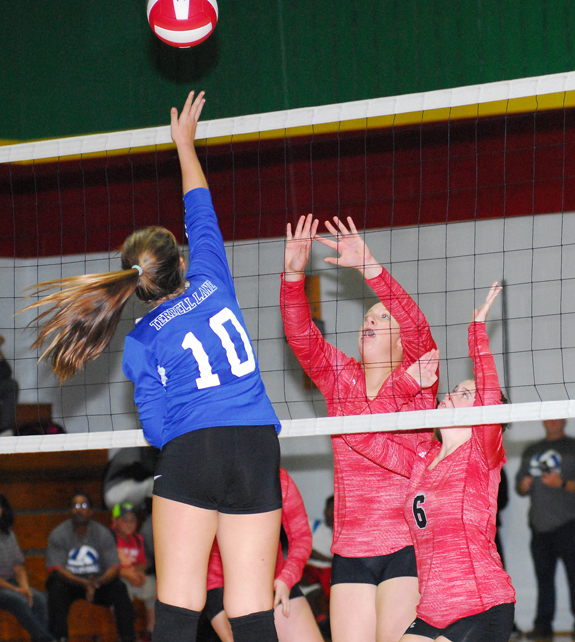 LOUISBURG -- While it may have stung at the time, Louisburg High School volleyball coach Erica Wammock definitely saw a silver lining in last Wednesday's tough loss to South Granville in the finals of the Northern Carolina Conference Tournament. It was Louisburg's first setback of the campaign -- something that Wammock didn't see as a bad thing heading into this week's action in the Class 1-A State Playoffs. FRANKLINTON -- Franklinton couldn't have picked a better occasion to make a bit of history last Friday at the FHS Football Field. As part of its annual Senior Night festivities, the Red Rams honored a solid group of upperclassmen -- and earned their first-ever Big East Conference victory in the process. Franklinton trailed early but pulled away in the second half to register a convincing 35-14 decision over the Northern Nash Fighting Knights. 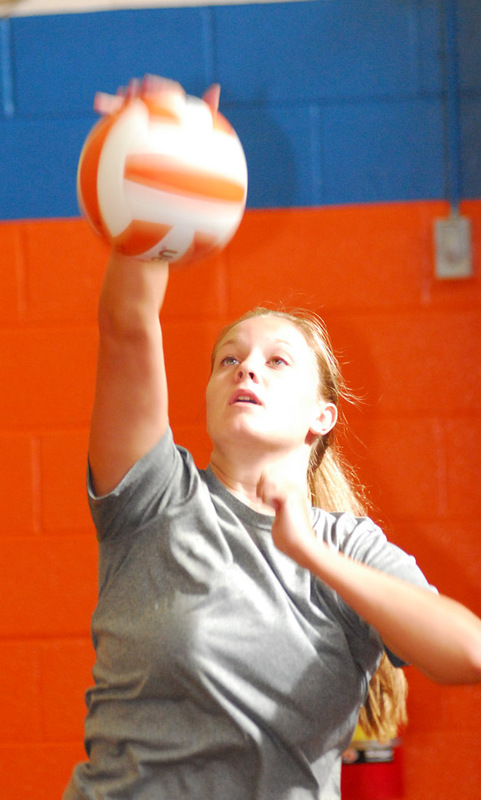 LOUISBURG -- From the moment she first stepped on to the volleyball court as a freshman standout, there was little doubt that Louisburg High School's Whitney Bolton would have the opportunity one day to compete at the collegiate level. That assessment has proven to be correct as Bolton, now a senior middle hitter, has verbally committed to continue her spike career at Meredith College, a Division III school located in Raleigh. NET CHALLENGE. 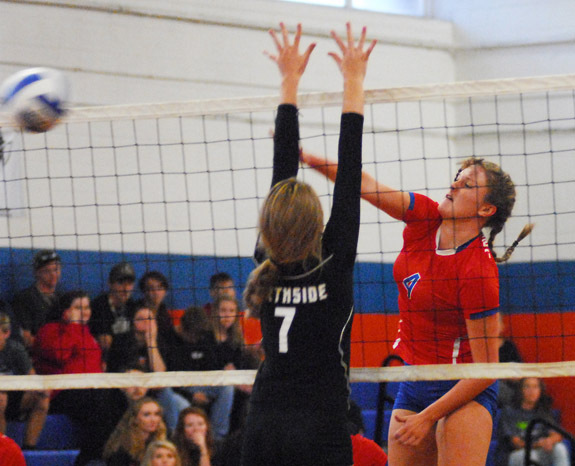 Bunn's Emily Winstead (center) and Gracie Mills (right) try to block Terrell Lane's Taylor Leonard. 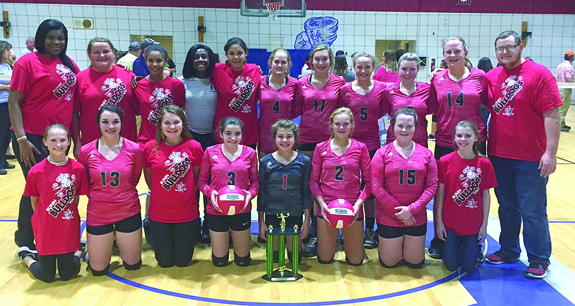 LOUISBURG -- Franklin County has developed a well-earned reputation for its volleyball success at the high school level between Louisburg, Franklinton and Bunn. 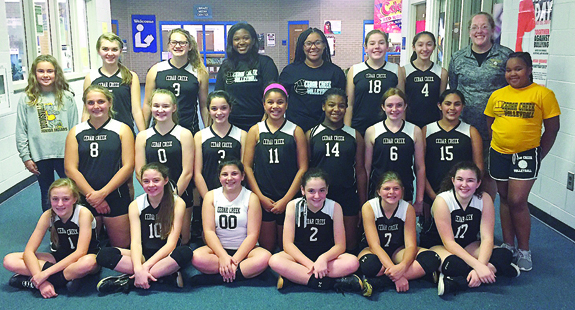 But the excellence doesn't just start there, as evidenced by Mondays' marathon at the annual Middle Athletic Conference Volleyball Tournament at Terrrell Lane Middle School. LOUISBURG -- Louisburg College's quest for a second consecutive undefeated football season is now just one victory away from being realized. 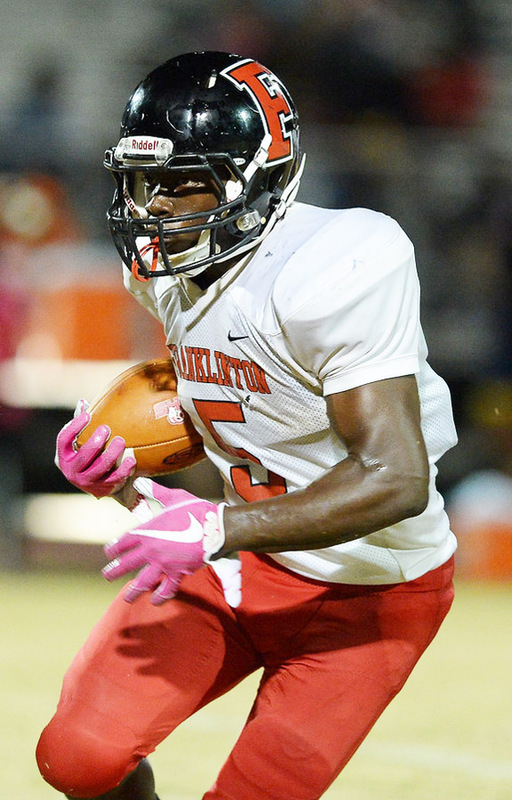 The Hurricanes took a key step toward that goal by rolling to a 48-17 home decision last Saturday over Palmetto Prep in a game that was played at Patterson Field on the Louisburg High School campus. 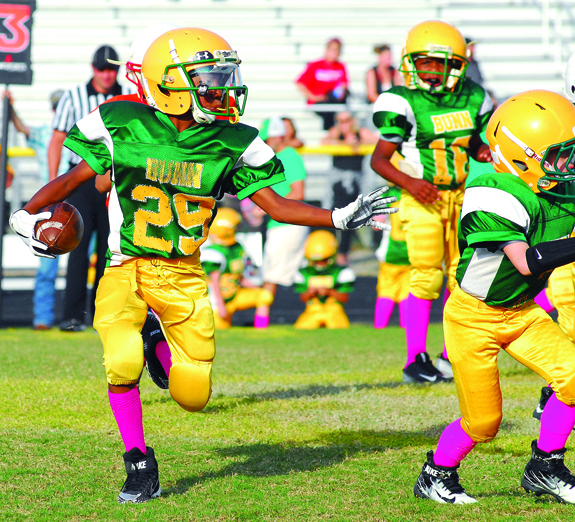 Bunn's Brendan Johnson looks for running room behind his blockers during last Saturday afternoon's home Mini Mite matchup against the Louisburg Warriors. LOUISBURG -- Lamont Hunt was a standout linebacker for Louisburg High School in the late 1990s -- and is in LHS' record books as one of its top all-time tacklers. 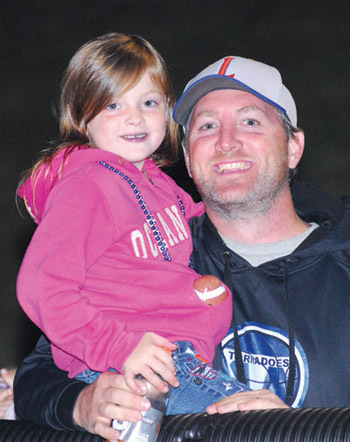 Hunt is now imparting some of his gridiron wisdom on another generation as he is serving as the head coach for the undefeated Louisburg Mini Mites in the East Wake Football League. 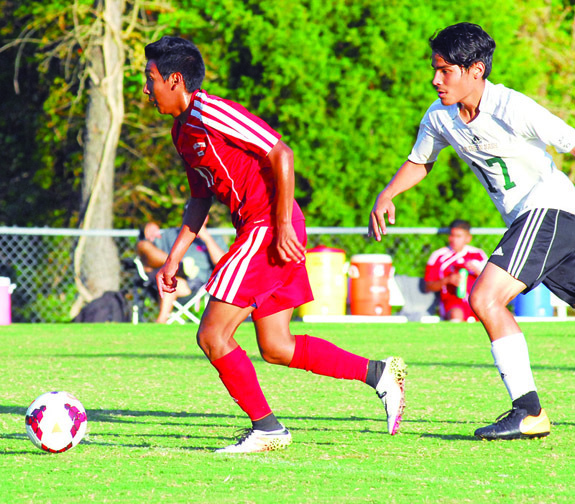 CHAPEL HILL-- Shannon Sefton from Panther Creek High School and Richard Lopez-Hernandez from Franklinton High School have been named recipients of the North Carolina High School Athletic Association's Performance of the Week awards. 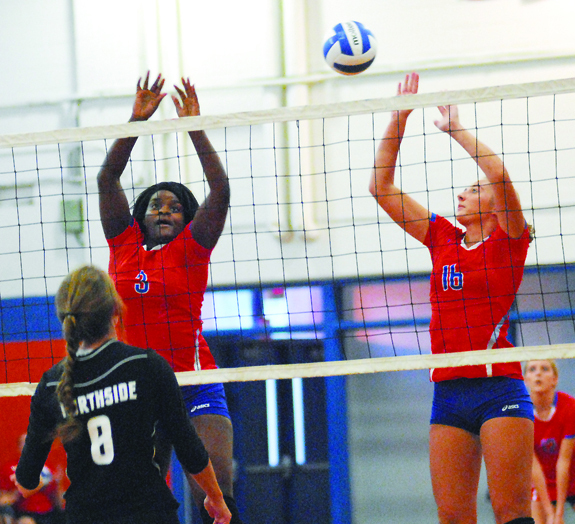 (L to R) Louisburg High School's Ti'ashia Frazier and Adriane Sullivan elevate for a block attempt Tuesday. South Granville quarterback Tucker Brown pitches the ball to a teammate as Bunn's Dylan Timberlake gives chase during last Friday night's football matchup. 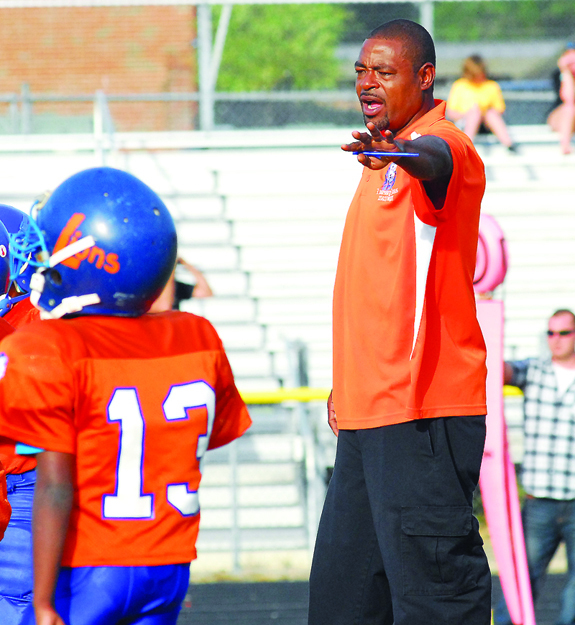 Former Louisburg High School linebacker standout Lamont Hunt is now serving as a coach for the Louisburg Mini Mites in the East Wake Football League during the 2017 campaign. KNOWLEDGEABLE VOLUNTEER. Teresa Green (left) is presented the Family Consumer Services Volunteer of the Year award by Extension Agent Dominque Simon. 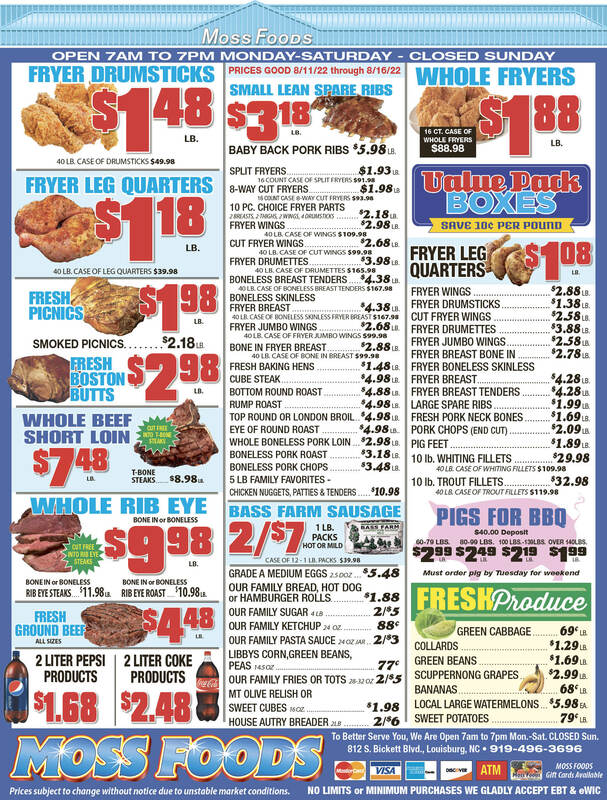 LOUISBURG -- Brochures touted the Franklin County Extension Center's Farm City Week as a celebration. 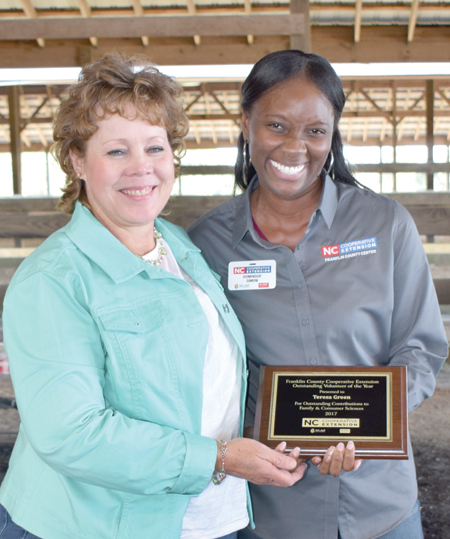 During the annual luncheon at Double D Equestrian Center last Friday, they lived up to that goal by celebrating those who volunteer their time, service and resources. They recognized operators of Double D Equestrian Center with the Conservation Stewardship Award. The Franklin County Cooperative Extension Service has a lot of friends -- and some of them were honored at last week's luncheon. Shown here (left to right) are Bill Spruill, Ed Wheeler, Brent Strickland, Bennie Ray Gupton (holding plaque), Travis Nelms. Steve Mitchell, Steve Nelms and Charles Mitchell, head of the local Extension office. 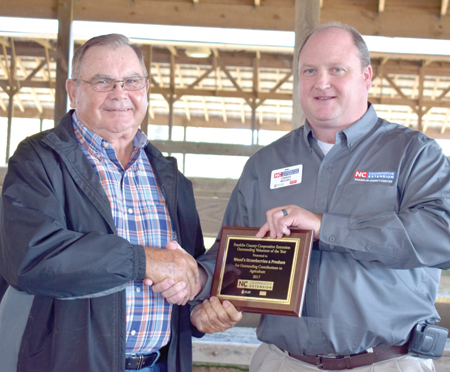 Billy Wood (left) of Wood's Strawberries and Produce was recognized as Franklin County's Agriculture Volunteer of the Year. Among other things, he allows his farm to be used for both training and education for adults as well as children. ON DISPLAY. 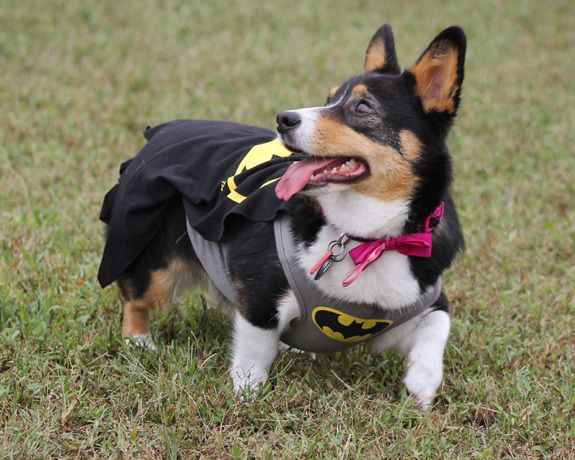 Above, a Corgi, disguised as Batman, was one of the stars of the event. The event drew people from around the state and beyond.